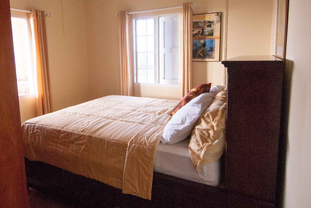 The Quill Homestay is located at the mountainside neighborhood known as Pleasures. The home offers magnificent views of the sleeping volcano from the backyard, and stunning sunset views from the front yard. The Quill Homestay is fully equipped, ready to serve as the perfect island getaway or vacation retreat — nature provides the rest. You get a large two bedroom vacation rental, in a quiet neighborhood with a Queen size bed, two single beds, living and dining area, a sofa couch, a fully equipped kitchen with refrigerator, stove, oven and microwave, bathroom with shower, Wifi.